Texels Eigen Stoomvaart Onderneming (TESO) launched their largest ship untill then when their second Dokter Wagemaker slided down the slipway at the Santierul Naval Galatz in the Romanian town of Galatz. With a lenght of 130,40 meters, a width of 22,15 meters and a tonnage measurement of 17.160, the ship was way larger then anything sailing at the Dutch/ German/Danish Waddenzee. This stretch of water is closed off from the North Sea by a series of islands along the northwestern coast of Europe and falls dry several times a day, making it possible to walk to the islands. One of the islands that is never reachable by foot is Texel, the first of the islands as seen from the Dutch coast. The crossing between the port of Den Helder and the island just takes twenty minutes, the same time as it takes to cross Lower New York Bay with the Staten Island Ferry, for example. Still, TESO saw reasons to introduce a ferry for this crossing that was larger then for example the fourth Midnatsol that was built around the same time for the Hurtig Ruten Norwegian coastal service or Swan Hellenic's Minerva, that is measures still under the 13.000 tons. 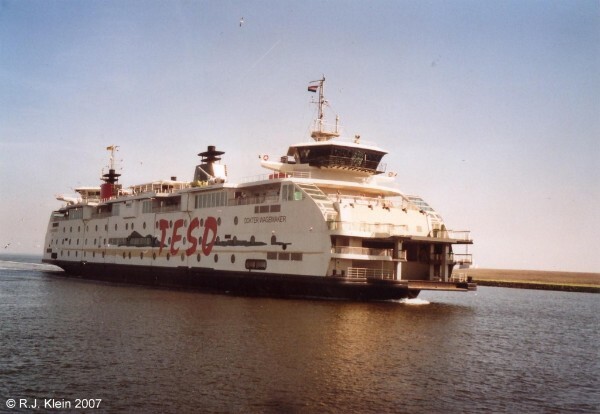 The main reason for this was, that the waiting times for the ferry to the islands was sometimes up to several hours, and something had to be done as the ferry is the only way to get to and from the island of Texel. The introduction of the new ship was not all well for the islanders who were to be served by it, as they also feared for the island to be overrun by tourists even more after the large vessels' introduction. This had also been the case when the company introduced the Molengat in 1980, the first double-deck ferry of TESO. This was now the ship that Dokter Wagemaker was to replace, as she had become way too small for the, indeed, growing traffic. The tonnage measurement of Molengat was just 3254 and her lenght was 88,26 meters, so the new ship would be a huge replacement. The 1990-built Schulpengat was to be the new ships sailing mate, but with 8311 tons and a lenght of 110,40 meters, also this ship is a lot smaller then the new one. Below, Dokter Wagemaker is seen in the summer of 2007. Dokter Wagemaker was named after the islands doctor who was one of the people that put money forward to found the company in 1907. The ship was able to sail with up to 1750 passengers at her five decks, of which the lower three were reserved for 300 cars. As the designers of the ship have noticed, today's cars are a lot bigger then when the former ferries were introduced, so the cardecks are designed with this in mind and so those are very spacious. When also lorries or busses want to go along, there is space for 30 of those, lowering the carcapacity to 200. The ship is driven by four Caterpillar diesel engines, giving her a speed of around 15 knots. She needs a crew of eight to sail and has, just like the earlier Molengat and Schulpengat, a bridge forward as well as aft, so she doesn't have to turn around in port. Also, the ship has two enginerooms, two swichboards and two operating computers so that if one system fails, the other one can be used. Another novelty to the route is the way the ship docks, as magnets were attached to the dockingspace, so she doesn't need to be using traditional ropes. As the ferry just takes twenty minutes to reach the other side, the lounges aboard are spacious and comfortable, but the ferry lacks entertainment, a true resatuarant or shops. But she has, as a first for a ship of her status, at least an atrium as well as four elevators that take the passengers to and from the cardecks and provide disabled passengers a way to reach the upper decks without climbing the stairs. Before the ship was introduced, the company considered modern ways of propulsion, like sunpower, windpower, LNG and biofuels, but it seems that the time then was just too early for a change like that. In the new Texelstroom, introduced in 2016, the time was there and environmenfriendly ways of propulsion were installed. The interiour spaces of the ship are a lot lighter then aboard the earlier ships, mostly due to the large windows that look out also over the front and back of the ship. Her interiours were designed by Bastiaan Sonneveld, together with the Bureau for Shipbuilding. This Bureau designed all TESO ships since the 1950's. In the design, nautical elements are the key and the difference between port and starboard are shown in the colours red and green. The decks have a teakmotive and the bartables are designed like navigationtables. The shape of a lighthouse is found back in the vertical lines that run towards the skylights above the salon and the 14-meter high atrium. For the ship, also a new colourscheme was introduced, leaving the traditional yellow colours of the hull to the past. Instead, Dokter Wagemaker introduced and artists view of the island, as seen from the sea. The launch at the Romanian wharf was witnessed by around 3000 workers, who even took their wives and kids to watch the event. The ship was launched sideways into the Danube river, a method that is used more with smaller ferries when there is no space enough to launch them traditionally. At the 1st of july 2005, miss Fedder-Janssen named the ship and she is in fact the granddaughter of the doctor whose name is on the ship's sides. This ceremony was performed in The Netherlands, as the ship was towed to the Royal Schelde Shipyards at Vlissingen, The Netherlands, to be fitted out, departing Romania at the 17th of january 2005. The towing voyage took her across the Danube River, the Bosporus, Mediterranean Sea, the Bay of Biscay and the English Channel so it was a long and little hazardous journey. But all went well and the ship was delivered to her owners at the 5th of september of 2005. Her first crossing from Den Helder to Texel was sailed at the following 16th of september. A little normal for a ship in this kind of service, she suffered little to none mentionable mishaps of glories. At the 14th and 15th of august of 2007, the ship was off her normal route as she was used for special cruises with stockholders of the company. For this, she also sailed towards the former port of Oudeschild, where the company depated the island before the new port was build that is used nowadays. When in the end of may of 2016 the new Texelstroom was added to the route, the Dokter Wagemaker took over the role of reservevessel from the Schulpengat, that had been put up for sale. As reservevessel, the ship will be sailing at peak hours, as well as take over from the flagship while she is out for maintainance.